This document reviews how news media is using the term vegan . It reveals many of ways in which veganism can be portrayed as merely a plant-based diet. Related pages look at definitions offered by dictionaries and animal advocates. My use of the term is unlike any found here, but I believe it's more consistent with the history of veganism. Please visit My Face Is On Fire, a blog by abolitionist Mylène Ouellet, for analysis of veganism in the media that is up-to-date and far more in-depth. There was quite a fuss in 2007 when parents in Atlanta declared themselves vegan as an excuse for starving their child to death. All of the quick write-ups on this event that lacked an explicit definition could leave someone with the impression that ‘vegan’ equals dietary restrictions . A BBC News summary cemented this understanding by stating: "strict vegans adhere to a diet that avoids all animal products" . In 2008, a report aired on CNN that was widely disseminated in the months following its appearance on YouTube under the title "Vegan Revolution" . The six-minute segment does not deviate from the pattern established when correspondent Alina Cho opens with remarks that link "going vegan" with "a plants only diet". Until noted, all remaining items were first published in 2009. Korky Vann wrote "Turn Over A New Leaf" for the Hartford Courant, a Connecticut newspaper . It was reprinted by The Ledger under the title "Being Vegan is Trendy These Days" and in The Pioneer Press as "Suddenly, vegan lifestyle is glamorous, gourmet, gossip worthy" . Vann describes vegans as the "latest high-profile foodies" who are sparking a "food trend". Shopping for ingredients and cooking are discussed, along with restaurants and health matters. The topic is nourishment throughout. Amanda Berne recounted her experiment with "Going vegan for a month" in the San Francisco Chronicle . She defines vegans as people who "take vegetarian a step further" and "don't eat any product created by an animal". Only the "strictest" among them recognize that insects are animals and thus avoid substances like bees' honey. Of her experience, Berne reports: "despite all the hassle and the countless hours spent planning meals, I was shocked at how much I enjoyed being vegan". Jim Williams contributed "Cravin' for Vegan" to Health Key, which is a service of the media conglomerate Tribune, owner of ten newspapers and twenty-three television stations . His work was reproduced in several of these outlets, including the Chicago Tribune . Williams says vegans have a "respect and compassion for rights of all living creatures" that leads them to not eat "flesh, fish, fowl, dairy products of any kind". He assures readers the "vegan lifestyle doesn't mean you have to sacrifice your taste buds". Emily Sohn's article "Vegetarian kids" was circulated by the LA Times . The word vegan appears five times, each in the context of nutrition. One instance places "veganism" in a category of "extremely restrictive diets" along with the macrobiotic system. Michelle Rupe Eubanks and Lisa Singleton-Rickman wrote about "Families adopting vegetarian lifestyle" for the Times Daily, an Alabama newspaper . After describing how some vegetarians will "consume fish or poultry on occasion", they identify "others, called vegans" who "cut out animal products of any kind, including eggs and dairy products". 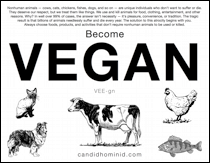 Perhaps their understanding of veganism stems from their discussion with Maria Camp, who facilitates the Shoals Vegetarian Fellowship yet was cited as saying "we promote the vegan lifestyle at our meetings" . An issue of Experience Life Magazine, which has print readership over half a million, contained a piece by Kristin Ohlson titled "The New Veganism" . Though not traditional news media, subscribers would probably grant it equivalent credence. She only mentions dietary issues, but this is not surprising given that she references figures such as Rory Freedman and Erik Marcus (both discussed here). A glossary of "food-selection practices and ideologies" is provided that lists "vegan" along with the descriptor: "eats no meat, eggs or dairy, and no animal-derived ingredients like gelatin, honey or whey". The final piece comes from 2010. Grant Butler, writer for The Oregonian newspaper, conducted a trial in the month of February. The article announcing his plan carries the revealing title "Going vegan: A life-long carnivore gives up meat, eggs, dairy" . His belief that "being vegan means eating no animal products at all" was made clear from the outset, and held through the subsequent pieces . Massive centralized news agencies are increasingly popular, and local news outlets favor reprints over creating originals. Owing to these factors, listing every appearance of the works in this document was not always feasible.